For weeks and months our team of Green Party candidates have pounded the pavement, meeting as many voters as possible. Our five-point plan for Ontario’s future has resonated with hundreds of thousands as our campaigns have knocked on countless doors in local communities in every corner of our great province. Election Day is virtually upon us. In three short days, Ontarians will have their opportunity to cast their vote for our Green vision. Our candidates have worked tirelessly to earn the trust of your friends and neighbours. There is still time to help your local candidate in a final push to deliver our message to voters. 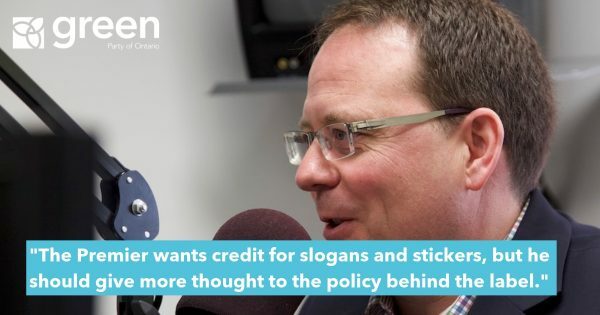 Before the media blackout comes into effect, they can still air a few more radio spots – such as our final commercial on Good Government – or publish an ad in their local newspaper. Please make a final donation to your local candidate today using this special link. This has been a hard-fought campaign, and our candidates need your support for the final push. If you are unable to make a monetary donation, or want to do something more, please consider donating some of your time between now and Thursday. A few volunteer hours of your valuable time will help us deliver our vote on Election Day. Our candidates deeply appreciate your efforts. It motivates and encourages them to go all out until October 6th. Please help them as much as you can. P.S. If you have not yet heard our other four radio ads, click here or here to tune in!